Some of the fantastic music and talent that will be part of our concert tomorrow evening! We have guest conductors and accompanists along with intrepid soloists! It’s going to be amazing! Hope to see you there! 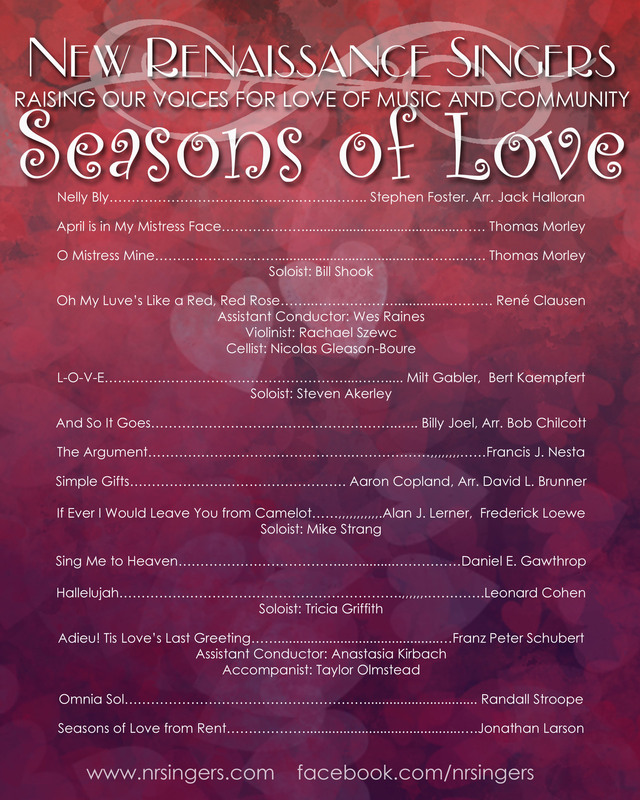 This season, The New Renaissance Singers have added a third venue to their concert schedule. In addition to performing at the Columbia Street Baptist Church and the Church of Universal Fellowship, the group has added a performance in the beautiful Hampden Congregational Church. 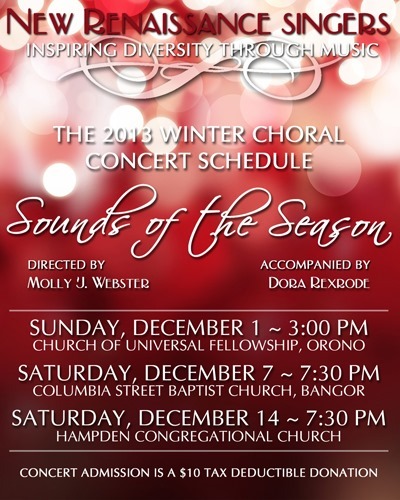 The choir will perform three main concerts this holiday season, beginning with a matinee on December 1st at 3pm, at the Church of Universal Fellowship in Orono. On December 7th, following the Downtown Festival and Tree Lighting, the group will perform at the Columbia Street Baptist Church, followed by a gathering with snacks and drinks downstairs. They will wrap up the concert season on December 14th at 7:30pm, at the Hampden Congregational Church. The choir, under the direction of Molly J. Webster, will be performing a wide variety of music from around the word, including songs of the season from as far away as Africa and Russia, beautiful favorites like Still, Still, Still and Do You Hear What I Hear, and much more! In addition to the main concerts, New Renaissance Singers will perform several concerts at area senior homes throughout December. Your Donations Help Support Our Music! Winter Choral Concert December 15th!